Well, the 25% tariff on steel and 10% tariff on aluminum from Canada, the European Union and Mexico go into effect at midnight tonight! Spooky! The DOW is down 200 points on the news! Can't wait to hear how the countries involved will respond. 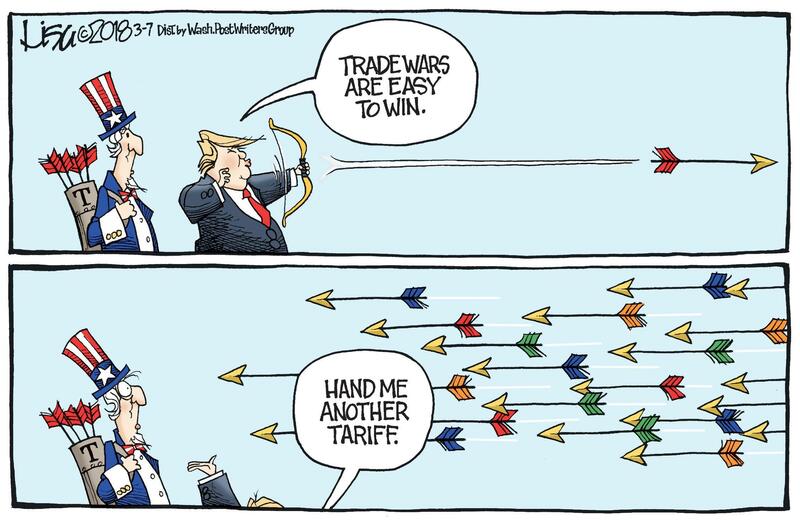 It is being reported that Trump's tariffs on China will not go into effect until next month. Fasten your seat belts! We are in for a bumpy ride! Canada responds to Trump's tariffs with retaliatory tariffs on U.S. goods! Also, even Republicans were surprised by Trump slapping tariffs on our allies. "Republicans Gobsmacked by Trump's Tariffs: GOP lawmakers thought the president was going to hit China — not key U.S. allies"
"Sen. Ben Sasse (R-Neb.) warned that similar policies 90 years ago sparked the Great Depression. 'This is dumb. Europe, Canada, and Mexico are not China, and you don’t treat allies the same way you treat opponents,' Sasse said. ‘Make America Great Again’ shouldn’t mean ‘Make America 1929 Again.'" When you repeat Trump, you help Trump!